Brutus, NY (December 18, 2018) – Police have released the name of a working man who was tragically killed in a tractor accident while working on Friday, December 14. 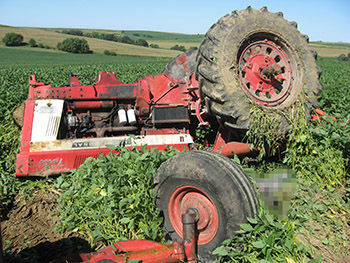 45-year-old Christopher M. Komoroski, of Auburn, was sadly pronounced dead after he became the victim of an accident in which the tractor he was on rolled over for reasons that remain unknown at this time. Komoroski was reported to have been working on a tractor at 9475 Oakland Road when the large machine overturned and pinned him underneath it. Police arrived on the scene along with emergency medical crews where they found him deceased due to the injuries he sustained in the accident. Currently, police have not determined whether the incident was due to a medical episode, mechanical failure, another party, or other reason. The investigation into the fatal accident is ongoing at this time. No further information has been released regarding the cause of the incident or anyone else involved. First and foremost, our warmest thoughts and prayers are wholeheartedly extended to the loved ones of Christopher M. Komoroski during this devastating time. Accidents while working occur all-too-often, especially while engaged in duties that include the use of heavy machinery. Furthermore, workplace accidents in New York are often fatal, and while it can be terribly difficult, it is essential to understand that you may have significant rights following such an incident. At Hach & Rose, we understand the immeasurable loss that follows the sudden loss of a loved one, and there is no reason that the bereaved family should suffer any further losses as a result. As members of the community, our empathetic New York accident attorneys are here for you 24/7 to any questions you may have. If you have lost a loved one in a New York workplace accident, please don’t hesitate to call 212-779-0057 and let us put our experience to work for you today.